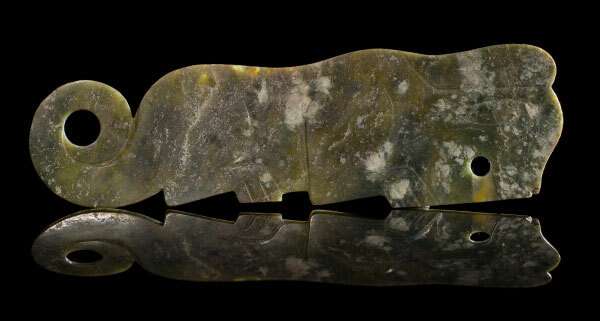 Jade has been an essential material of art and worship in China since its birth as a culture over 6000 years ago. The myriad of colours and translucencies formed the belief that the natural beauty of the stone held the essence of universe’s qi and thus a quintessential part of early culture. Historical context notes that the birth of jade culture in China corresponds with the beginnings of metallurgy and the invention of written language in the Ancient Near East (Tigris Euphrates). 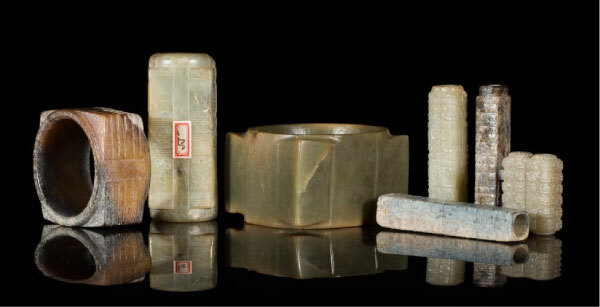 In China, jade was being carved in the areas along the Yellow and Yangzi Rivers, considered to be the birthplace of Chinese civilization including the Neolithic period Yangshao, Hongshan and Liangzhu cultures. 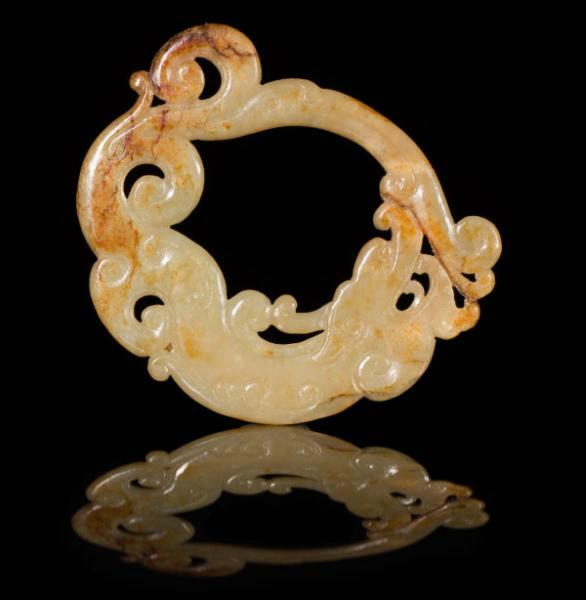 Carved jade was an essential part of ritual, as represented in funerary ceremonies. Small jade objects or pendants were kept for personal prayer and larger objects became symbols of social status. The Liangzhu jade ritual congs (lots 1062-1071 in the Asian Arts Auction on November 25) were carved with mask like faces on each corner, later to become a key symbol for the Taotie or monster mask in later Bronze Age design. By the Shang dynasty (1675 – 1046 BC), the cong as a ritual object became symbolic of earth and bi discs became the symbol of heaven. Jade became a key component in Shang funerals and burials. It was believed that when the body decomposed, it would transmit the essence of the soul into the jades in the grave. 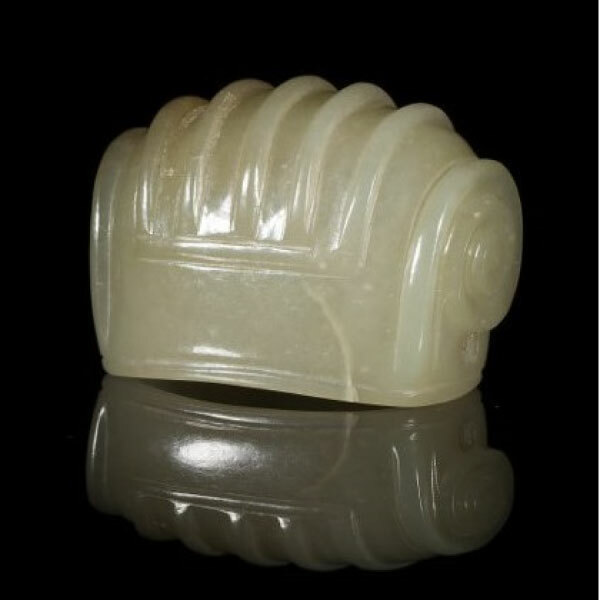 From the Neolithic period through to the Han dynasty, jades were an integral part of the burial. In early tombs Jade carvings were placed on symbolic areas of the body; the Neolithic three-pronged pendant (lot 1052 in the Asian Arts Auction on November 25) was placed on the forehead of the deceased with awl pendants (lot 1053) around the temples, split bis (lots 1058 and 1059) on the ears and cicadas on the tongue. Bi discs and ritual congs were placed on the arms and body, and in the Han dynasty pigs (lots 1084-86 and 1134-37) were places in the hands of the body to signify wealth and prosperity in the afterlife. The 19th and early 20th century brought a renewed interest in Chinese culture and history. As the banks of the rivers were developed as China modernized, rare jades were being unearthed, disturbed from their original burial sites, they became echoes of a lost culture. 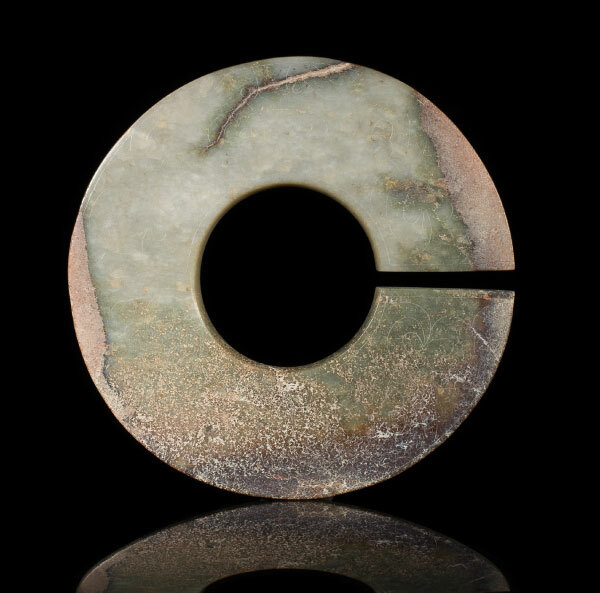 The Langleb collection represents a rarely offered selection of jade from these historically significant early cultures as well as key pieces from the Ming and Qing dynasties. Spectacular Asian Art Results at Leslie Hindman and Skinner!